Happy November, dolls! I seriously can't believe November is already here. That means our wedding is only 171 days away and I couldn't be more excited! ::enter huge grin emoji:: ANNNND my wedding dress comes in at the end of this month....I seriously can't wait to put it on again!!! 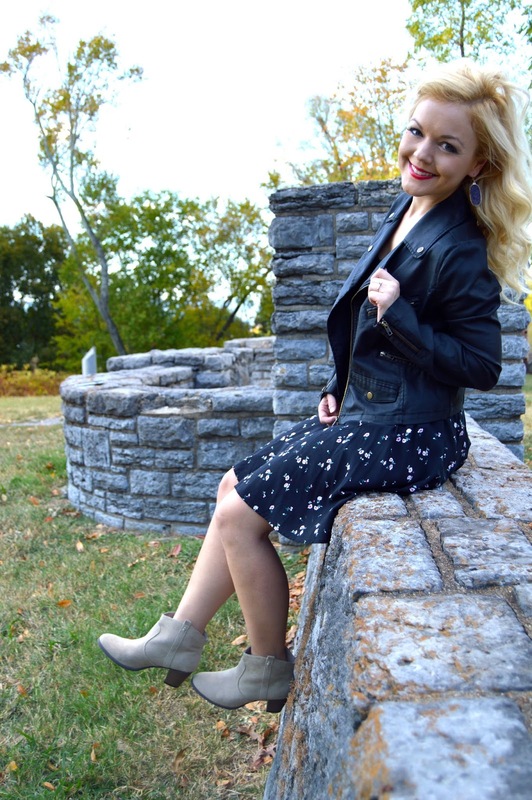 For tonight's post, I'm sharing with you one of my favorite fall looks: fall florals. I bought this dress during the warmer summer months, but fall'd it up (totally jut made that expression up but I think it's pretty legit lol) by adding booties & my leather jacket. This is a great way to transition your summer pieces into fall. It is STILL in the 80's here in the south, so it's so easy to wear the jacket in the morning when it's chilly and take it off by the afternoon. That is my definition of the perfect fall transition outfit! You could also add a scarf if it was extra chilly. I've linked my exact same dress above, but in different prints (my exact print was not online). Also....this BP jacket is one of my FAVORITE pieces I have bought this fall!! It seriously goes with so many things & is super comfy. Be sure to check it out at Nordstrom!